Are you in the market for a Shark Hoover? Shark make some fantastic corded and cordless hoovers but navigating their product range can be a bit of a minefield. 1 Are you in the market for a Shark Hoover? 2.2 But Which Model do I need? 6.4 Who is the Shark Corded Stick Hoover Range Designed For? 7.4 Who is the Shark Cordless Hoover range designed for? 8.4 Who is the Cordless Handheld Hoover designed for? 9.4 Who is the Cordless Lift-Away Upright Hoover designed for? Features such as Flexology, DuoClean and Lift-Away sound great but what do they actually do? To help you find the best Shark hoover for your needs we’ve put together an ultra quick buyers guide if you are strapped for time and a longer more in depth one if you need more information. If you are after our recommended Shark hoovers then check out the links below – for more information on each product, please scroll down. Shark are a highly innovative company dedicated to taking the hassle out of cleaning by providing advanced thinking to everyday issues. They have developed a great range of corded, cordless, handheld and upright hoovers that are ergonomic, lightweight yet powerful and capable of taking on nearly every hoovering tasks you can think of. These vacuum cleaners are all premium products, but with feature sets and a warranty to match. Innovative technologies such DuoClean, the Flexology system and anti-allergen sealing are all backed up by an exceptional 5 year guarantee. But Which Model do I need? The internet is full of review sites that claim they have bought and rigorously tested every product so they can give you the best buying advice. Tripadvisor has some fake reviews, so who can you trust? At ToolsReview, we pick individual products, ranges or whole categories of tools and spend hours pouring over technical information, manuals and forums to find out everything you could possibly want or need to know about the products. We bundle all that information into a buyers guide so you can make an informed decision based on your needs without doing the legwork. We pride ourselves on being independent and objective – if we don’t like a product we’ll tell it as it is. In the early part of the 20th Century the Hoover brand dominated the vacuum cleaner market. As a result of this the name hoover soon became syonomous with vacuum cleaners and was used to describe one regardless of the actual brand. Around the same time the word hoover also entered the English language as a verb (to hoover something). While technically all the models featured in this buyers guide are vacuum cleaners, in the UK the terms are used interchangeably and so will we. Shark produce some fantastic, easy to use vacuum cleaners – here we break down the range, give our overview and personal take on each. We’ll give you what we see as the advantage and disadvantages of each before presenting our final recommendations. Shark’s range of corded stick vacuums consists on an entry level model and two more advanced models. The entry level HV330UK is a powerful and well featured vacuum cleaner and while it does sacrifice some of the more advanced tech of its more expensive cousins, it comes in at a very attractive price point. The better specified HV390UK and HV390UKT models also feature Sharks DuoClean technology, using dual powered rollers in the brush head to maximise pickup from a single pass. These models also are designed around Shark’s Flexology principles, with a flexible neck for easy low-level cleaning and and the ability to fold down to 50% height for more convenient storage. In fact the only real difference between these two models (apart from colour options) is the inclusion of the Pet Power Brush for easily cleaning pet hair from carpets and soft furnishings. Who is the Shark Corded Stick Hoover Range Designed For? I would say that the Corded Stick Hoover range is designed for as a primary vacuum for small to medium and as a secondary, more mobile unit for a larger home. The inclusion of Flexology features also assists those with reduced mobility – the ability to clean under a sofa without having to get down on your hands and knees is probably worth the price premium on its own. The up to 10m cord also allows you the freedom to roam around larger rooms or even whole floors of smaller houses without the need to keep swapping plug sockets. 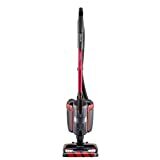 The Shark Corded Stick Vacuum range shares a number of advantages with its cordless brothers and sisters but without the need to charge the batteries regularly. If you are happy to trade some of the convenience of the cordless version with longer run times, then this can be an ideal tool for the larger home. As with any roller based cleaning head, regular maintenance to clean out longer hair is required, but beyond this you should have plenty of trouble free hoovering. The smaller capacity dust cup (0.49L) can be overlooked by the fact that its bagless and very quick to empty, lowering running costs. All the members of the range convert from more traditional style stick vacuums to hand vacs with the press of a button, making them ideal for getting into hard to reach areas. Compatible with carpets and hard floors. Advanced models can be pricey. 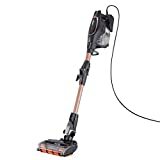 Of the three models in the range, the HV330UK, HV390UK and the HV390UKT I’d personally pick the Shark Corded Stick Vacuum Cleaner [HV390UKT] due to the inclusion of the Pet Power Brush. Shark have been very competitive with their pricing and at the time of publishing (March 19) they were offering the HV390UKT at a lower price point that then HV390UK which doesn’t include the attachment. Led lights illuminate hidden dust. Extra-long 10m cord. If your budget is limited, then the base model HV330UK is still a great specced hoover for the price – with equal or better specs than devices from other manufacturers at this price point. The Shark Cordless Vacuum range, the IF200UK, IF200UKT and the IF130UKTH are the jewel in the crown of the Shark product range. Featuring iconic design and cutting edge cleaning technologies, Shark delivers a powerful, ergonomic and deep cleaning solution in a colourful, cordless package. The Cordless Stick Vacuums excel when used as a traditional lightweight upright or as a powerful handheld. The 0.33L dust cup is easy to empty and clean and the whole hoover can be stipped down for easy cleaning and maintenance. All models feature an exceptional 5 year warranty ensuring that these vacuums are investments that will serve you well for years to come. Who is the Shark Cordless Hoover range designed for? The Shark Cordless Vac system is designed to completely replace a more traditional upright vacuum. By combining Sharks two flagship technologies and feature sets, Flexology and DuoClean – this lightweight cleaner is designed to make everyday cleaning easier. This vacuum is ideally suited to homes with both carpet and hardwood flooring as you can switch modes on the press of a button with no swapping of cleaning heads. The main advantages of the Shark are its ergonomic design and its weight. At just 4 kg this vacuum can go anywhere and is well balanced regardless of what mode you are using it in. The running lights on the powered head also helps to show up dust and particles in hard to reach areas such as under and behind furniture. This is a nice touch and surprisingly helpful. The 22 minute run time (on the single battery models) should be enough to do most small houses in a single hoovering session, although those with larger areas to clean may want to consider either picking up an extra battery (around £99) from the Shark EU website, or investing the extra and going for the twin battery model from the outset. This battery is also removable so you have the option of charging as part of the hoover or charging separately. The choice is yours. Depending on the model chosen, you’ll also have the option of the extra deep-cleaning motorised pet tool, that removes even the most stubborn pet hair from carpets and upholstery and the Anti-Allergen version which has HEPA filters and a special seal that traps 99.9% of particles. The Anti-Allergen version also has a slightly longer run time of 30 minutes rather than 22 minutes, which is something worth considering if you have a large area to clean. As with most of the Shark ranges, the core product is nearly identical – the only changes are cosmetic, ie the colour and the choice of bundled accessories. If you have pets, then we’d recommend the IF200UKT model with its motorised pet brush for easy pickup of pet hair but if you also suffer from allergies, then you’d benefit from the IF130UKTH model with its HEPA filters and enhanced dust seals. We firmly believe that whatever one you pick you’ll end up with a very powerful and versatile vacuum system. In our opinion, the best Shark Cordless Stick Vacuum in the range is the IF130UKTH version – Sharks pricing is very competitive and at the time of writing (March 19) this was the same price as the base model with neither the allergen seals or the pet attachment. The extra 8 minutes of run time is the icing on the cake. Shark also have released dual battery versions of the above (model numbers IF250UK, IF250UKT and IF260UKTH respectively) that in addition to doubling the running time also include a double charging dock so both can be charged at the same time. The Shark range of Cordless Handheld Hoovers consists of a single model of vacuum cleaner, but with two different battery options. The devices are sleek and powerful and excel at dealing with everyday dry spills and pet hair. The integrated HEPA also filter traps dust and fine particles and helps maintain air quality around the home. Who is the Cordless Handheld Hoover designed for? 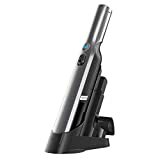 The Shark Cordless Handheld fits into a well established niche in the home, that of the small handheld hoover. These are designed as a handy extra device, supplementing an existing hoover but not replacing it. Use cases would be for dry spills around the home, cleaning the car or anywhere where a more traditional vacuum would find hard to reach. The Shark Cordless Handheld is a great little gadget that’s both small in size and powerful, far more than you’d expect. This does come at a cost though, with a battery life of just 8 minutes for the single battery version and 16 minutes (with a battery swap out) for the dual version. For most of the time this shouldn’t be too much of an issue and its a compromise worth making – no one in their right mind would expect to do a full hoover with this hand held – it’s simply not designed for that task. The device excels at picking up small spills quickly and cleanly and is great for use in the kitchen, in the car or around kids. The Shark Cordless Handheld is a great alternative to other manufacturers hand vacs but it shares both the advantages and disadvantages of the style of device. That being said, it is a very handy device to have to hand on hand, especially in potentially messy areas like the kitchen. My top tip would be to keep it in its changing cradle when not in use so it is always charging. This negates some of the problems around long change and short running times. The Shark Cordless Handheld is regularly on offer so we’d recommend going for the single battery version as the dual is harder to find. You can always pick up a spare battery from the Shark website for around £40. The Shark Cordless Lift-Away Upright Hoover range combines the convenience of a cordless vacuum with the power of a more traditional upright vacuum. Who is the Cordless Lift-Away Upright Hoover designed for? The Cordless Lift-Away Upright Hoover range is designed to replace your traditional vacuum cleaner with a modern, flexible device capable of any hoovering task you throw at it. The Cordless Lift-Away Upright Hoover range combines the best technology that Shark has to offer – Flexology design, DuoClean technology, a removable lithium battery and Powered Lift-Away. The hoover also has a larger storage capacity in the dust cup of 0.6L (compared to 0.49L of the Stick cleaners) so you’ll be emptying less in the long run. Allergy sufferers are also looked after as these also include Sharks Complete Seal technology that captures and traps 99.9% of dust and allergens inside the device, stopping them from being released back into the atmosphere. This range of cordless vacuums combines all the best bits of technology from across the whole Shark range – but carries a premium price tag. The vacuum cleaner converts from an upright to a hand held in the press of a button allowing you greater flexibility when hoovering. The powered DuoClean head also ensures a great clean even when used as a hand held. The 50 minute run time in extended mode is also one of the longest in market, allowing you to do a whole house on a single charge. You can charge the vacuum cleaner either by plugging directly into the wall via the included charger, or by removing the battery and charging at another location – Shark makes this choice yours. All of this is backed by an unparalleled 5 year warranty – 2 years for the battery, so you’ll be in good hands. As with other Shark Hoovers the Cordless Lift-Away Upright Hoover range is priced competitively and regularly have offers available. If you have pets then I’d recommend the IC160UKT model with the additional motorised pet tool, but the price is often so close that you’d probably be better picking this model up even if you don’t as I’m sure you’ll find it handy in the future. What’s the difference between Shark Lift-Away and Powered Lift-Away? Shark Offer a number of different models of upright vacuum and nearly all feature either “Lift-Away” or “Powered Lift-Away” – but what’s the difference? Standard Lift-Away models feature a powered head but allow you the flexibility of detaching this and using the vacuum as a hand held for use with hard to reach areas. Powered Lift-Away models take this an additional step further. The body of the vacuum detaches from the wand rather than the head allowing you to continue benefiting from the extra cleaning power of the powered rollers when in handheld mode. For hard to reach areas you can always detach the head as with the standard Lift-Away vacuums – you get the best of both worlds. Sharks DuoClean technology combines two powered rollers in the cleaning head. The front roller – made from soft felt, picks up dust and small particles, while the second roller, made from tougher bristles, picks up larger debris. The combination of the two DuoClean rollers also allows you to switch between cleaning hard floors and carpets and rugs without needing to stop and swap out the heads. A simple button on the grip changes modes with the minimum of fuss and bother. Shark Flexology isn’t a single technology, but rather a collection of features unique to the Shark hoover range. The premise behind Flexology is that you can reach, store and charge anywhere. Shark have engineered their vacuums to be easily reconfigurable, depending on your cleaning task. Need to reach a high spot? One button detaches the cleaning head and you can reach the ceiling. The flexible neck also enables you to clean hard to reach areas without needing to get on the floor – this makes Shark an ideal choice if you struggle with mobility. This flexible neck also allows you to fold the vacuum up for storage, reducing its height by 50%. By making the lithium powered battery detachable, Shark allows you to charge the batteries installed with the hoover or away at a more convenient location. Need longer running times? You can simply pick up a second battery.. easy. Are Shark vacuums good for pet hair? 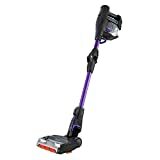 All Shark vacuums are powerful for their size and will do a good job at picking up stray hairs, but if you have a pet cat or dog then we really would recommend going for one of the TruePet versions [LIST MODELS]. TruePet models include an optional accessory – the Deep-Cleaning Motorised Pet Tool. This is a motorised bristle bar used to draw pet hair out from furniture, rugs, sofas and car mats. Deals on the TruePet versions are nearly always available, often at a lower prices than the standard versions. Can you buy spare parts for Shark Hoovers? One of the major benefits of investing in a Shark hoover (similar to Dyson and Gtech) is that spare parts are readily available direct from the manufacturer. Nearly every part is available as a spare – so if you need a replacement roller, wand, powered head or even the casing itself, Shark have you covered. How long do Shark vacuums last? As with all home appliances, how long they last very much depends on the workload and how they are cared for. If you hoover 4 times a day for weeks on end then naturally you’d expect the life to be shorter then if you use it a couple of times a week. Shark provides a very generous 5 year warranty on all its Vacuums consisting of 12 months standard and an additional 4 years when registered. Steam mops have 12 months with an additional 12 months if registered. A 5 year guarantee is almost unheard of in the home appliance world, Shark clearly have confidence in their product line. – Normal wear and tear – fuses, belts and batteries etc. These are all standard for most manufacturers. If your vacuum ever develops a fault during the guarantee period then Shark will repair or replace it free of charge.